We trace the history of the College to the founding of the University itself; the first courses taught at Alabama were in liberal arts subjects: mathematics, modern and ancient languages, natural history, chemistry, philosophy, literature. The College of Arts and Sciences is the largest of The University of Alabama’s academic divisions, and the largest public liberal arts college in the state. We offer 100 programs of study spanning the arts, sciences, and social sciences. We’re also the most comprehensive liberal arts college in Alabama, offering the only academic programs in the state in 19 subject areas.  The College of Arts and Sciences offers 100 programs of study across 64 fields, including 29 major programs and scores of minors, concentrations, and specialized tracks. Students can also craft their own majors through self-directed and independent study programs. Internationally recognized scientists, writers, artists, and scholars teach in Arts and Sciences classrooms and labs. Our students work closely with professors who are not merely experts in their disciplines, but also creators of new knowledge. Rhodes Scholarship: Only 32 students in the U.S. each year are selected as Rhodes Scholars, which is considered the most prestigious liberal arts award in the Western World. The College has had a total of 14 Rhodes Scholars selected. Fulbright Scholarship: In 2014, UA had its highest number of Fulbright Scholars, 14, and all are graduates from the College of Arts and Sciences. Goldwater Scholarships: Only 250 Goldwater Scholarships are awarded by the Goldwater Foundation nationally each year. They are given to top students who plan to enter the sciences, mathematics, or engineering. Goldwater Scholars receive up to $14,000 over their junior and senior years. The College of Arts and Sciences has had 14 Goldwater Scholars in the last ten years, and more than any university since 2006. Truman Scholarships: The Truman Foundation awards 90 students nationally each year for demonstrating excellence in academics and public service. Since the scholarship began in 1992, seven College of Arts and Sciences students have been selected for the Truman. USA Today All American Academic Team: Each year, USA Today selects the “best of the best,” what it considers the 20 top students in the nation. Ten College students have been chosen for this recognition since 1991. The most recent, Chere LeBerte who received an honorable mention this year. Chere is concentrating in interdisciplinary applied science in the New College program. Jacob K. Javits Fellowships: Awarded to only 75 students each year in the humanities and social sciences, the Javits Fellowship provides for four years of graduate tuition at the graduate institution of the student choice plus a $15,000 a year stipend for study at the masters and doctoral level. The College’s first Javits winner, Michael LeMaster, an English and Philosophy double major, was selected in 1998. Nearly a third of our undergraduates work on independent research and creative projects under the guidance of faculty mentors. Our performing arts groups — in theater, dance, and music — and lecture programs stage more than 700 events each year, ranging from art exhibits to readings by acclaimed authors to experimental theater.